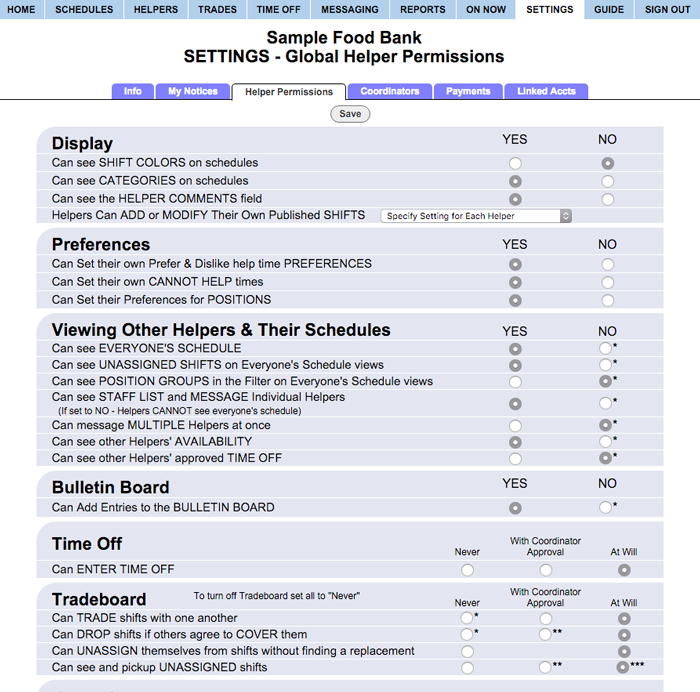 Coordinators (with permission to change Organization Settings) can choose what all helpers are allowed to see and do when they sign in at WhenToHelp.com. Can see SHIFT COLORS on Schedules: Set to "Yes" to have Helpers see the optional colors you may set for shifts instead of seeing them displayed as all black. Some coordinators may not want Helpers seeing colors if they use colors to rate the Helper's performance on that shift or to mark them as late, etc. Normally it would be useful for Helpers to see shift colors that the Coordinator uses. Can see CATEGORIES on Schedules: This option allows Helpers to see any shift categories you have set up - ex. in the Category Chart, etc. Note that if this option is set to "No" the Helpers will not see categories even if your corresponding coordinator view displays them. This option might be set to "No" if you use categories to designate when an Helper is late or called out, etc. Can see HELPER COMMENTS field: This option allows helpers to see the comments you have entered about them from the Edit Helper window. Ex: You might want to enter accrued vacation in that field and allow them to see it. Set to "Yes" means that when helpers sign in they can see and change the times they prefer and dislike helping (there is no down side to letting helpers enter this information as it does not affect any existing shifts and you can choose to ignore it when using AutoFill). Setting to "No" means helpers cannot view or change their Prefer and Dislike and Cannot Help times. Set to "Yes" means that when a helper signs in, their Help Time Preferences will also allow them to paint times as Red (Cannot Help). (Cannot Help times are only used by AutoFill, they do not affect any existing shifts). If set to "No" then only coordinators with permission to edit helpers can change the Cannot Help times for each helper. Set to "Yes" to allow helpers to see a list of the positions you have set them to be able to help and they can choose whether they prefer or dislike each position. Then if you AutoFill, this preference will be considered. This can be useful if you have multiple locations and want them to be able to set which locations they prefer to help. When set to "No" the helpers do not see the Position Preferences link and are not able to set these preferences - only coordinators (with permission) can set what positions they prefer each helper to help. Can ADD ENTRIES TO BULLETIN BOARD: The coordinator can always add entries to the Bulletin Board and employees can always view the Bulletin Board - to allow helpers to post entries, set to "Yes". Can ENTER TIME OFF: Set to "Never" to have helpers not see the Time Off section, nor request time off through that system. "With Coordinator Approval" allows helpers to see and use the Time Off section where they can send in a request for full or partial days off and the coordinator must approve it before it becomes effective. "At Will" allows the helpers to create a time off that goes into effect immediately, without the coordinator needing to approve it. Any overlapping shift the helper is assigned will be set to unassigned when the time off is approved. Note: If you want to prevent helpers from ever seeing other helper names, you must set all the options highlighted to "No". Can view EVERYONE'S SCHEDULE: Helpers can always see their own schedule when they sign in. If you set this option to "Yes" they then can also see the full schedule that includes everyone. If you set this option to "Yes", then the format that is displayed for the helpers for each view - Daily, Weekly, Monthly, Chart, In-Out etc. is identical to the format you set on on the corresponding Main Coordinator view using the Change Layout links. Ex. if you set the In-Out chart to show two weeks, then the helpers will see that same In-Out view when they sign in. Can see UNASSIGNED SHIFTS on Everyone's Schedule: If you allow helpers to see Everyone's Schedule, you can also set this option to allow any unassigned shifts to appear on that schedule view along with the assigned shifts. Set to "Yes" to have any open shift display on their Everyone's Schedule view. Can see STAFF LIST and MESSAGE OTHER HELPERS: Set to "Yes" allows helpers to see the Staff List and whatever information each helper has set to be viewable by other helpers. If you set this option to "No", helpers will not be able to see other helpers' names anywhere in the system. This setting overrides seeing Everyone's Schedule, etc. Can view other helpers' AVAILABILITY: Set to "Yes" means that when a helper signs into their helper account and clicks on one of their own shifts, a link will appear with the shift details saying "Availability of Other Helpers for my Shift". Clicking the link will then show the helper a list of all other helpers who could help for that shift along with their relative availability (their preferences, shifts already helping, approved time off, etc) during their shift time. This is designed to help a helper trying to find a replacement for their shift. If you set this option to "No" then the link does not appear.